Arcadia, CA (January 26, 2019)-S Y Sky was unable to shake clear of Queen Bee to You in Saturday’s $151,053 Sunshine Millions Filly and Mare Turf Sprint at Santa Anita. That half-length margin between the two mares on the hillside and early stretch remained the same at the finish. 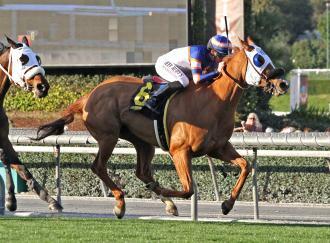 For S Y Sky, the Sunshine Millions Filly and Mare Turf Sprint for California-breds was her third stakes win. For Queen Bee to You, the race was her second runner-up finish in a statebred stakes in the last six months. Through the duel, jockey Joe Talamo thought he had the edge with S Y Sky. The win was the fourth victory, and second stakes win of the day, for trainer Phil D’Amato. He won the California Cup Sprint earlier in the day with Touching Rainbows. S Y Sky ($6) ran about 6 1/2 furlongs in 1:12.52. Queen Bee to You, a 10-1 outsider who was second in the Solana Beach Stakes at Del Mar in August, finished two lengths clear of Fiery Lady, a 24-1 chance who finished third. S Y Sky set fractions of 22.07 for the opening quarter-mile and 43.98 for a half-mile, closely followed by Queen Bee to You. Bella Luma finished fourth, followed by Pulpit Rider, Cordiality, Barbara Beatrice, and Halo Darlin. Fiery Lady, Pulpit Rider, and Halo Darlin are out of Lady Railrider. Pulpit Rider, 4, and Halo Darlin, 6, are full-sisters by Lucky Pulpit. Fiery Lady, 5, is by Unusual Heat. S Y Sky races for owner and breeder Nick Alexander. A 5-year-old mare by Grazen, S Y Sky has won 5 of 9 starts and earned $457,320. She won her debut in the Evening Jewel Stakes for 3-year-old statebred fillies at 6 1/2 furlongs on dirt in April 2017 and the Melair Stakes for statebred 3-year-old fillies at 1 1/16 miles on dirt a month later. Talamo has been aboard for all nine of S Y Sky’s races.